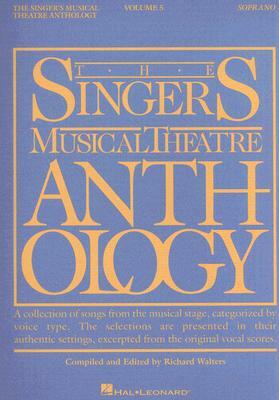 The Singers Musical Theatre Anthology: Volume 5: Soprano (Paperback) | The Drama Book Shop, Inc.
(Vocal Collection). The world's most trusted source for authentic editions of theatre music for singers has expanded with yet another volume. Many of the songs are found in no other collections. The 40 songs in each volume are in the original keys, excerpted from vocal scores and piano/conductor rehearsal scores. Includes both recent shows and a deeper look into classic musicals. Contents: THE APPLE TREE: What Makes Me Love Him * BARNUM: Love Makes Such Fools of Us All * CANDIDE: Glitter and Be Gay * DIRTY ROTTEN SCOUNDRELS: Nothing Is Too Wonderful to Be True * DO RE MI: Cry like the Wind * THE DROWSY CHAPERONE: Bride's Lament * FIDDLER ON THE ROOF: Matchmaker * FUNNY FACE: He Loves and She Loves * GREY GARDENS: Daddy's Girl * Will You? * Around the World * Another Winter in a Summer Town * JUBILEE: Begin the Beguine * KISMET: Baubles, Bangles and Beads * LADY, BE GOOD : Fascinating Rhythm * The Man I Love * THE LIFE: I'm Leaving You * THE LIGHT IN THE PIAZZA: The Beauty Is * Fable * LITTLE WOMEN: Some Things Are Meant to Be * MARY POPPINS: Practically Perfect * Anything Can Happen * MR. PRESIDENT: The Secret Service * MYTHS AND HYMNS: How Can I Lose You? * OKLAHOMA : People Will Say We're in Love * ON THE TWENTIETH CENTURY: Never * PETER PAN: Who Am I? * My House * ROSALIE: How Long Has This Been Going On? * SHE LOVES ME: No More Candy * 1600 PENNSYLVANIA AVENUE: Take Care of This House * SONGS FOR A NEW WORLD: The Flagmaker, 1775 * SPRING AWAKENING: Whispering * STRIKE UP THE BAND: I've Got a Crush on You * SUNSET BOULEVARD: Too Much in Love to Care * WEST SIDE STORY: I Feel Pretty * Somewhere * WICKED: Let Us Be Glad * Thank Goodness * not from a show: The Girl in 14G.